For the obvious reasons of human safety and animal cruelty, bear wrestling hasn't been in vogue for several decades. 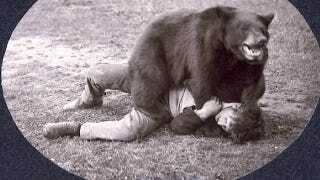 But up until the 1980s, bear wrestling was the stuff of amateur wrestling matches and basketball halftime diversions. Here are some surreal tableaus of humans getting the crud smacked out of them by much larger, much stronger animals. The practice of keeping bears for amusement — common in the 19th century — has thankfully fallen out of fashion, making this image very difficult for contemporary Canadians to relate to. Add to that the apparent disinterest of the bear in his obviously unhappy "wrestling" partner, and you have a very strange image indeed. It costs [Victor's owner] Tuffy about 5% of his gross to obtain various types of insurance, but it is financially impossible for him to afford the premiums he would have to pay to actually insure the people who choose to climb into the ring and take on Victor. You wrestle him at your own risk. Since Victor has had the pleasure of about 50,000 different opponents by now, the lack of insurance is obviously not a prevailing deterrent. Occasionally, when Victor first gets to town, there is some public reluctance to match muscle with him. When that happens Steve Renfrow, a young man learning the bear business who travels with the Truesdells, serves as a "stick," which is an old carny euphemism for confederate. He comes out of the crowd and volunteers so that his bravery will inspire others. By the end of Victor's stay in a town much greater demands are placed on his services, since many young men come back for a return bout, invariably bringing along a girl friend, wife or other members of the family who will be impressed by bravado. The footage of Victor wrestling above comes from matches with professional grappler Victor "The Destroyer" Beyer and a bout from 1981, against what appears to be a bunch of extras from Roadhouse. You can also check out another one of Victor's matches here and a match from another famed ursine grappler, Terrible Ted. It's unclear what happened to Victor — he's certainly passed away since the 1970s — but this semi-outdated site has some warm and fuzzy accounts from Victor's sparring opponents.